A wide path meanders through the arboretum west of Palm Drive in Palo Alto where the Stanfords once had their residence. The residence was destroyed in the 1906 earthquake and for a time the site became the location of a cemetery for the family and faculty of the university. The cemetery was eventually moved to Arastradero Road in the early 1900s, but the grave of Jane Stanford’s brother Henry remains at its original site; it is near the path, surrounded by a decorative fence and marked by a large marble sculpture of a weeping angel of giant proportions. Henry Clay Lathrop died in 1899, shortly after Stanford University opened for students. 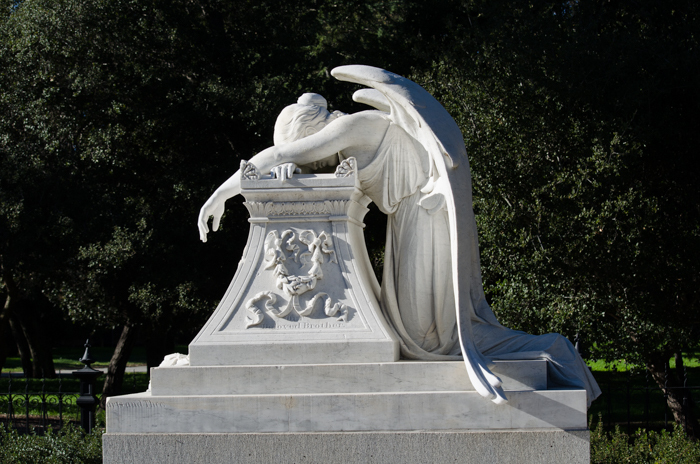 Jane Lathrop Stanford, who was deep in grief over the deaths of her son Leland Jr. and her husband Leland, had Henry buried in the small cemetery near the Stanford residence and ordered a commemorative angel —A replica of The Angel of Grief by William Wetmore Story— from Italy. The monument arrived in 1901, and was placed over Henry’s grave under a stone cupola. 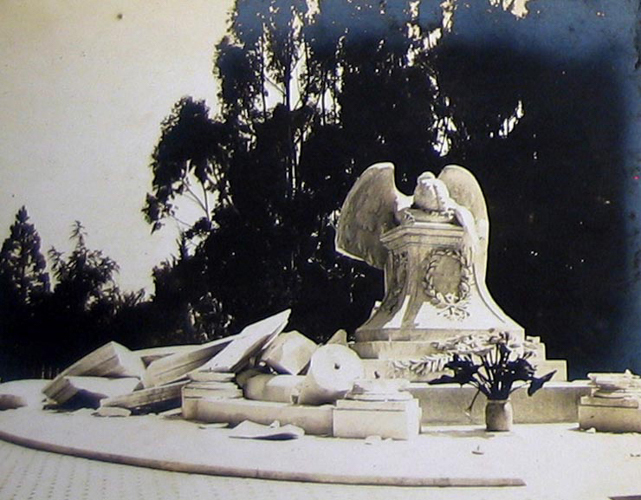 The earthquake of 1906 toppled the cupola and destroyed the statue. A replacement for the broken statue was ordered, and installed in 1908 on the original site, but without a cupola. And there it languished for many years. Eventually neglect and vandalism nearly destroyed the monument a second time. 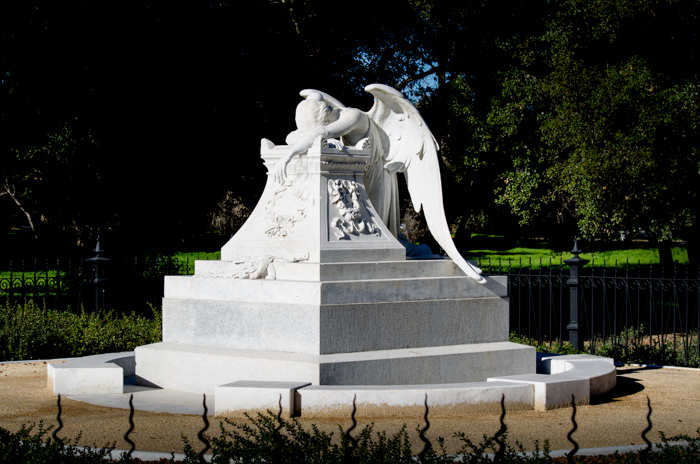 A restoration of the gravesite was begun by the Stanford Historical Society in 1990 and completed in 2001. 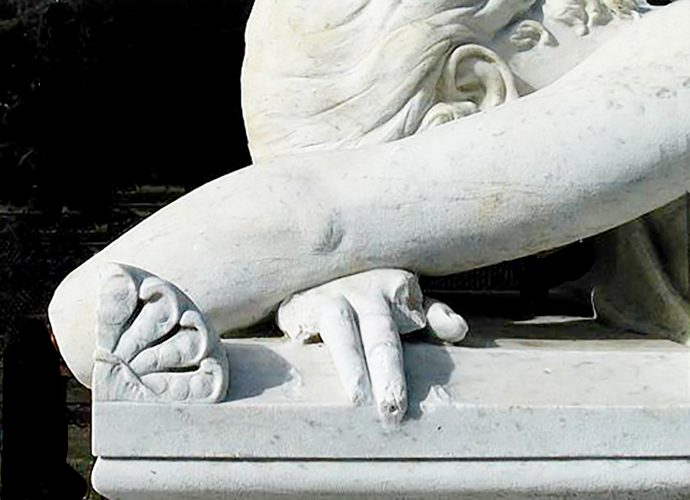 The angel’s missing arm and damaged hand were restored in 2001 by Los Angeles artist Marcel Mächler. 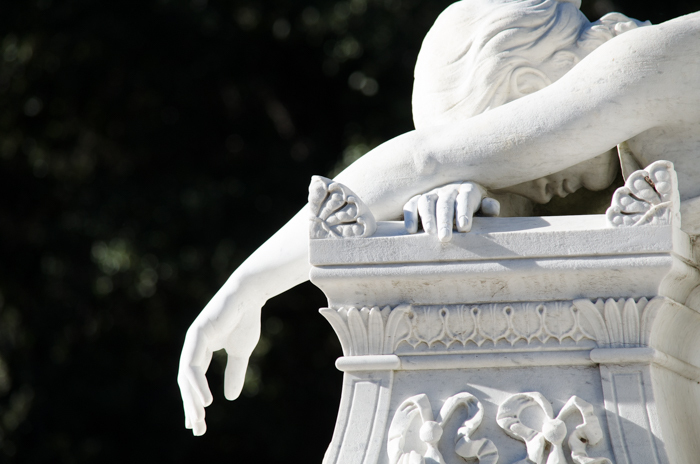 The Stanford Historical Society records show that Jane Stanford did not especially like the Angel of Grief. Her reasons were complex, but perhaps the kneeling position of the angel bothered her. She might better appreciate the elegant curves of the angel’s wings in this three-quarter frontal view. How big is the angel? The artist who did the repair in 2001 estimated that the angel would be 7 feet tall if standing. This week’s photo challenge was “depth — let’s dig (or dive) deep”. I choose to go in-depth, giving more detail than usual. To see how other bloggers interpreted this theme, follow the link to WordPress Photo Challenge.